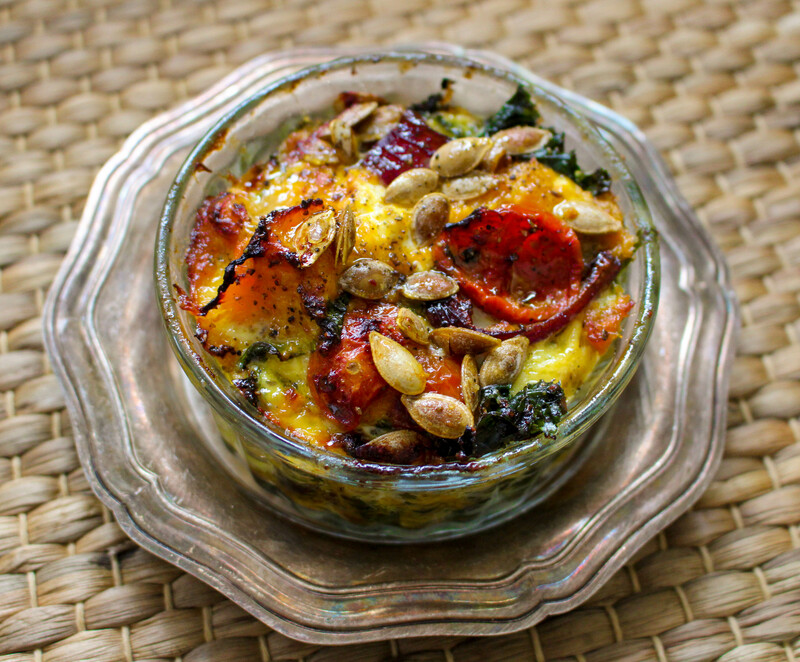 Squash and Kale go so well together and it’s the sweetness of the squash and the sun-dried tomatoes along with the bitterness of the kale that makes this a winning combination. Feta adds a sour note and Parmesan brings an umami element to this simple tray bake. This mix can be formed into burgers or patties or can be served in individual dishes as shown in the photo (above) if you want to serve it as a starter for a dinner party. Place the peeled and diced squash in a tray and bake for about 30-40 minutes until tender. Meanwhile cut the red onion into wedges and fry in a pan with some oil and salt and pepper. Once softened, add a glug of balsamic vinegar then cook for a few more seconds until the vinegar thickens. Once the squash and onion are cooked, take a large mixing bowl and a potato masher and roughly mash the squash (not too much). 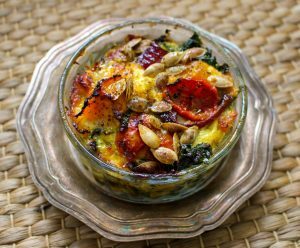 Add the kale, the sun-dried tomatoes (plus a tablespoon or two of the oil they come in), Parmesan, Feta, eggs, a tablespoon or so of pumpkin seeds, a pinch of oregano, a good grating of nutmeg, chilli flakes and season with salt and pepper. Top with a few more pumpkin seeds and a drizzle of oil. Mix well then transfer to a baking tray and cook for about 30 minutes at 180C.